My street is a closed military zone! Amid escalating violence Palestinian school children continue to bear the brunt of harsh Israeli policies and prolonged military occupation. Since Oct 30th Israeli authorities have declared large parts of Shuhada Street and Tel Rumeida (H2) in Hebron’s city center a closed military zone. In this same area where several Palestinians were shot and killed during this fall; harassment and violence from settlers is commonplace. Hebron’s appearance is slowly changing… while carrying out are usual EAPPI tasks, we can observe both – the Israeli settler’s and the Palestinian resident’s efforts to transform the city. Israeli settler efforts are concentrated mainly on Shuhada Street and Tel Rumeida hill. They tend to highlight the ancient Jewish heritage in Hebron. That’s why they paint graffiti on the door of closed palestinian shops, they arrange gardens in place of streets formerly leading to the old city market, they put informative signs and mark tourist paths. Recently, they also renamed the streets in the area of settlements in the old city. On the top of Tel Rumeida hill the ongoing archaeological excavations will create a Biblical Park explaining the Jewish history of the site and the city. On the other hand, the Palestinian Hebron Rehabilitation Committee (HRC) focuses its efforts on the Old City of Hebron. They rebuild houses demolished by Israeli forces, restore the former look of historical sites of the old city, and make better everyday life of its inhabitants, many of whom have moved out of the Old City after its closure. Lastly, HRC also strongly promotes tourism and other sectors of Hebron’s economy. This graffiti was recently painted on a shop door in Shuhada Street. Photo EAPPI/D.Peschel. Grafitti on Shuhada Street saying, “Happy Hebron Coop.” Photo EAPPI/D. Peschel. A tree swing located where a street used to be before the closure of Hebron. Photo EAPPI/D.Peschel. A garden on Shuhada Street created by Israeli urban management. Photo EAPPI/D.Peschel. Israeli names on Shuhada Street area. Photo EAPPI/D.Peschel. Israeli tourist signs on Shuhada Street. Photo EAPPI/D.Peschel. Israeli settlers hung up a new sign renaming the legendary Shuhada Street. Photo EAPPI/D.Peschel. A new street sign marks the new Israeli tourist path climbing up Tel Rumeida hill. Photo EAPPI/D.Peschel. Tourist signs by the Checkpoint 56. Photo EAPPI/D. Peschel. EAs by a map of the ‘Biblical Park’ being built by Israeli authorities. Photo EAPPI/D.Peschel. Archaeological excavations on Tel Rumeida hill. Photo EAPPI/D.Peschel. Excavation work on Tel Rumeida hill. Photo EAPPI/D.Peschel. An Israeli tourist path on Tel Rumeida hill. Photo EAPPI/D.Peschel. Surely the ‘Biblical Park’ won’t be Palestinian. Photo EAPPI/D. Peschel. The ‘Friendship Garden’ made through HRC and Temporary International Presence in Hebron (TIPH) cooperation . Photo EAPPI/D. Peschel. HRC office – Hebron. Photo EAPPI/D. Peschel. HRC began renovating the street leading to Kiryat Arba settlement. Photo EAPPI/D.Peschel. A building once destroyed by Israeli forces is now being restored by HRC. Photo EAPPI/D.Peschel. Renovated by HRC street leading to Kiryat Arba settlement. Photo EAPPI/D.Peschel. Renovations made by HRC . Photo EAPPI/D. Peschel. One side of the story. Photo EAPPI/D.Peschel. Now Palestinian efforts are concentrated on promoting tourism, which declined drastically after Shuhada Street was closed down. Photo EAPPI/D.Peschel. *Read more about the Archeological Excavations in Hebron. *Check out our Three-part series about Shuhada Street. This is part 3 in a 3-part series on the closure of Shuhada street and its impact on the community of Hebron. Open Shuhada Street demonstrations from 2011. This year’s week of solidarity will be February 21-25. Photo EAPPI/L. Tuominen. According to the “Agreed Minute” in the Hebron Protocol of January 1997, the process of reopening Shuhada Street “would begin immediately, and would be completed within four months.” It is now January 2014, 17 years since the agreement between the Israeli government and the Palestine Liberation Organisation was agreed upon, signed, and ratified, and yet Shuhada Street remains closed, empty, and useless. There appears to be no plans by Israel authorities to follow through on the internationally recognized agreement. 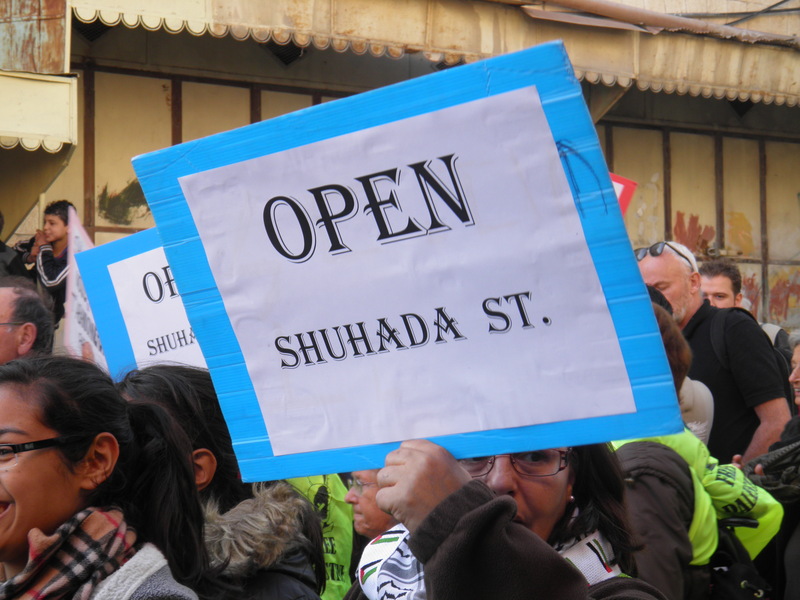 There are several organisations committed to realising the reopening of Shuhada Street most notably the Youth Against Settlements (YAS) initiated Open Shuhada Street Campaign (OSC). The aim of the campaign is simple: put pressure on the Israeli government through non-violent means to allow access to Shuhada Street for all people regardless of nationality, ethnicity, or religion. The campaign “protests the segregationist nature of the closure of the area and of the division that has been created in Hebron”, says Irene Nasser, a Palestinian activist. The South African based organization Open Shuhada Street “aims (to) raise awareness about the lack of freedom of movement in Hebron in the West Bank, and how this reflects some of the worst manifestations of the ongoing Israeli Occupation of Palestinian Territories.” Like YAS and OSC, Open Shuhada Street is committed to bringing about change using non-violent means such as advocacy and protest. You may wonder why such a fuss is being made about a single street when there must be multiple other streets available in Hebron. He explains that today he is required to walk 5km to a destination that he previously only had to walk 1km to reach. The simple inconvenience of a closed street not only interrupts daily activities but also reiterates the separation and access control policies of the Israeli occupation. The restrictions in force on Shuhada Street exemplify the imposed inequalities in Hebron and across the West Bank. In the occupation every action, regardless of how small it is, has an eventful impact. Nothing is insignificant. Nothing is unimportant. One street in Hebron represents so much suffering, so much discrimination, and so much hope. Let’s struggle to open Shuhada Street together! This is part 2 in a 3-part series on the closure of Shuhada street and its impact on the community of Hebron. 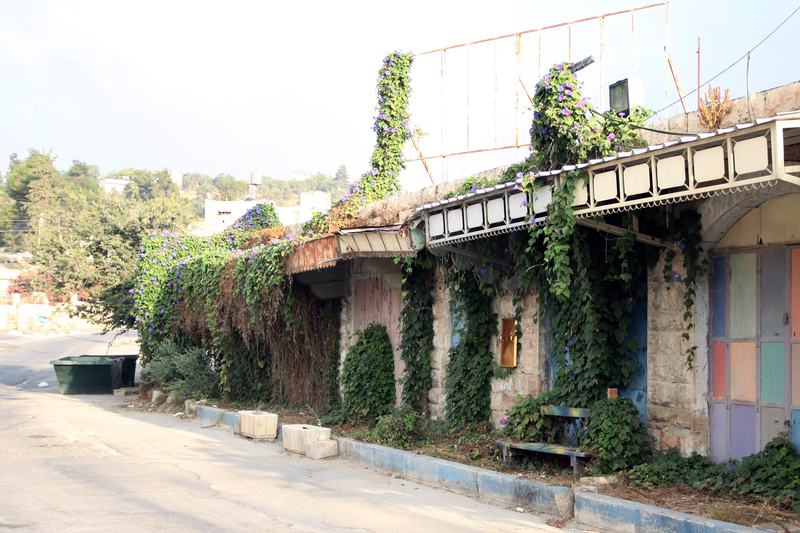 Former Palestinian shops in Shuhada street are now overgrown with plants. Photo EAPPI/J. Schilder, 2010. Today, the once lively Shuhada Street in Hebron is a shell of its former self. Welded shut doors, rusty awnings, graffiti-sprayed walls, weeds, and caged balconies characterize this once active and busy street. The street was essentially shut down during the second Intifada and access to the street denied to Palestinians. Despite Israeli pledges to reopen the street, Shuhada Street remains closed and eerily empty. Shuhada Street stretches from the entrance to H2 from H1 at Checkpoint 56 to the opposite side of H2 and Checkpoint 209 and is home to Israeli settlers and Palestinians. There are three settlements on Shuhada Street: Beit Hadassah, Beit Romano, and Avraham Avinu. The location of these settlements is what makes Hebron such a unique city as they are situated in the heart of a Palestinian city and Shuhada Street is closed to Palestinians because of it. Life on Shuhada Street for Israeli settlers is quiet. There is no traffic, pedestrian or vehicular, there is excessive security ensuring safety, there is a coffee shop, school, and museum. Residents of Beit Hadassah deliver snacks and hot tea to the soldier at Checkpoint 56 below their building each morning. Children wait at bus stops for the school bus to collect them. Worshippers walk up Shuhada Street to the synagogue and the Cave of Patriarchs. Tour groups of settlers and internationals peruse the street with interest and intrigue. As a settler, life on Shuhada Street is normal. Life on Shuhada Street for Palestinian residents is a struggle. Those still living on the street are forbidden from accessing the street and therefore using their front doors. As a result they are required to search for alternative access to and from their homes, which often means dangerous careering across staircases and rooftops. Many, if not all, of the balconies are encased in fencing with the goal of preventing stones and eggs reaching their belongings. Israeli settlers jog on Shuhada street. Photo EAPPI/J. Schilder, 2010. An Israeli settler walks with his children while carrying a gun on Shuhada street. Photo EAPPI/D. Wach, 2013. Checkpoint 56 is the entrance to shuhada street. It separates H1 from H2. Children must pass this everyday on their way to school. Photo EAPPI/J.Schilder, 2010. Two EAs model “protective presence as the walk with children on their way to Cordoba school. Photo EAPPI/M. Knoblauch. Instead of going along Shuhada street to get to Cordoba school, children must climb a steep staircase. Photo EAPPI/L. Jacob. A woman stands on her balcony. Once overlooking Shuhada street, it is not surrounded by a cage to protect her from stones and eggs thrown by Israeli settlers. Photo EAPPI/J. Mosskin, 2008. Cordoba School, for Palestinian children, is situated above Shuhada Street and access to the school is a steep staircase at Checkpoint 55 that also marks the border of Palestinian admission to Shuhada Street. Ecumenical accompaniers monitor this checkpoint and Checkpoint 56 two times a day during the school week. Israeli soldiers and settlers often harass children walking down Shuhada Street to school. EAs attempt to prevent such agitation by providing protective presence and in the process develop relationships with the children and teachers of Cordoba School. From the staircase leading to Cordoba School to the access road of the Ibrahimi Mosque, Palestinians are forbidden from walking or driving on the Shuhada Street. Approximately 30,000 Palestinians and 700 Israeli settlers live in the H2 partition of Hebron. For Palestinian residents, Shuhada Street is a clear symbol of the occupation. Israeli authorities use the Palestinian nationality as a weapon to control where they walk, how they live, and where they exist. 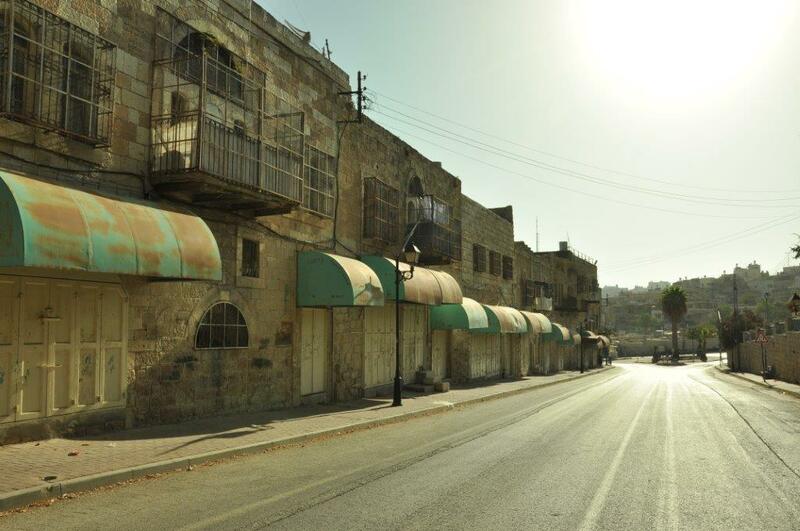 The empty Shuhada Street epitomizes the Israeli occupation. Life on Shuhada Street is a dream for some and a nightmare for others. For the Israeli settlers inhabiting Shuhada Street is a dream of access, peace, and protection. For the Palestinian residents of Shuhada Street life is a series of humiliating checkpoints and restrictions. It is a conundrum of rights and a skewed priority of safety. * Read Part 1: The Story of Shuhada Street.